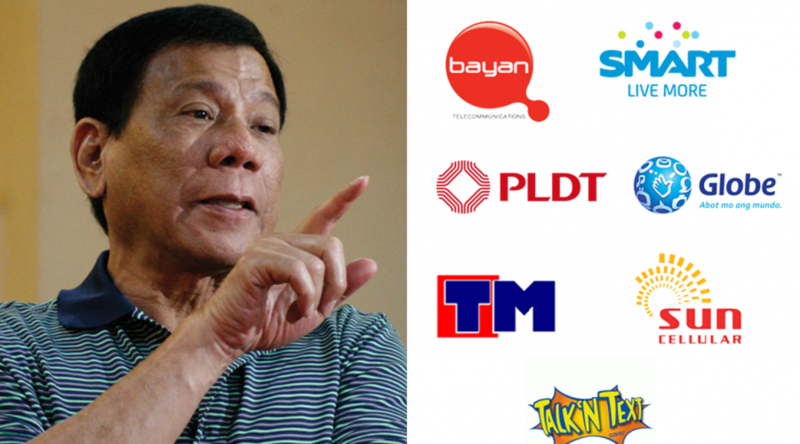 A senator believes that presumptive President-elect Rodrigo Duterte can improve the state of country’s Internet with the help of the Philippine Competition Act, which will encourage the entry of more players in the telecommunications industry. Sen. Bam Aquino expressed elation over Duterte’s pronouncement that he will encourage the entry of competition if local telecommunication players fail to improve quality of the country’s Internet. Sen. Bam said more players in the telecommunications industry will create competition in the market, which, in turn will result to improved service at affordable prices for consumers. It took 25 years before Congress finally enacted the Philippine Competition Act into law and it happened under Sen. Bam’s watch as chairman of the Committee on Trade, Commerce and Entrepreneurship. The Philippine Competition Act will help sustain the country’s ever-growing economy and ensure a climate that provides a level-playing field for all businesses. “We will continue to develop and push policies to provide the public access to quicker and more affordable Internet services,” added Sen. Bam, who spearheaded several hearings on the slow and expensive Internet service in the country. Meanwhile, Sen. Bam also lauded President Aquino’s approval of the creation of the Department of Information and Communications Technology (DICT) into law. “After last year’s hearings to investigate the country’s slow and expensive internet, we are finally seeing progress in our quest for improvement of internet services in the Philippines,” Sen. Bam said. “We are happy to learn that RA 10844, an act creating the DICT, was signed into law this week,” said Sen. Bam. Aquino: Will the gentleman from Ilocos yield to a few questions? Marcos: I will yield to questions but with the understanding that I will decline to answer anything on the merits of some of the complaints and accusations and the allegations that have been made as to the irregularities of the conduct of the campaign and the counting. Simply because I believe that this is not the proper forum for that. Aquino: Would you be willing to answer questions on the speech you had just made? Aquino: Thank you very much, Mr. President. Mr. President, I would like to echo also the call of the Senator from Ilocos Norte for eternal vigilance. I think right now, that is the call for all of us. All of the candidates. All of the people in different campaign teams, to be vigilant because as we know, the counting isn’t over yet. And as Senator Marcos’ camp is vigilant, I’m sure the other camps are also vigilant as well to make sure that no other – that nothing untoward happens during the canvassing process. So let me ask a few questions regarding some of the points that Senator Marcos had raised. Mr. President, you talked about the changes in the transparency server and to be frank, that was very troublesome, I think, for all of us when we found out that the transparency server was changed right there and then. In fact, I think Comelec castigated Smartmatic for having done that. But Mr. President, I’d like to clarify that this was done to the transparency server. Are you alleging that this was also done to the two other servers with an independent mechanism compared to the transparency server, Mr. President? Marcos: It is precisely why I have requested and have yet to receive any comment, answer or even acknowledgement of the request to look into the COMELEC server and to have my I.T. experts to look into the COMELEC server and to see if this is manipulation, interference changes had been done. So, unfortunately those requests have fallen on deaf ears thus far. Aquino: So in short, Mr. President, your call for a full audit is to find out if there were any irregularities in the two other servers? Marcos: Well, amongst other things, yes. Aquino: So in short Mr. President, currently, we only know that the transparency server was modified and of course, the story was because of the cosmetic change. But you want to check if there were also changes in the two other servers. Marcos: Well, I’d also like to check whatever happened as I think it has been explained in the various media. The fact that you have entered or rechanged the values of the hashcode have changed simply indicates that the file was entered into. How many times it was entered into? What was done while the file was open? And the operator was in the file and changing different parts of it? We cannot tell. And that’s why this assurance that we are being given that it was merely a cosmetic change simply has no proof behind it. Merely the assurances. But I think it is unanimous thus far, that so long as the file has been opened, and remains open which it did; it remained open until about 8 ‘o’clock on May 10 at which point the – I’m sorry this was later in the day on May 10th – until it was brought up by some of the watchers, and another Venezuelan operative of Smartmatic says “I’ll fix it” and basically locked the file open and thereby leaving it open to, for anyone to come so whatever changes were made over and above this so-called n change, then we cannot tell. This is why we have asked to look at the audit logs. We have asked to look at the transmission logs. We have asked to look at the receiving logs. We have asked to look at all of the records so we can see, we can be sure that the different values have remained consistent all throughout. Aquino: On that note, Mr. President, I think parties have come on record, even Congresswoman Robredo to say that we are open to a full audit. Marcos: Unfortunately those parties will not be the ones to decide whether or not we can go in and have a look at the servers. It is only the COMELEC who can give that authority. Aquino: That’s true Mr. President, I just wanted to state that for the record. But going back to the question on the transparency server, I take it Mr. President that you don’t accept the COMELEC explanation of what had happened. They had come out very strongly to say that this was merely a cosmetic change. Marcos: I can stand here and say many things, Mr. President but I have to back it up with data, with proof, with evidence and they have not done that. Aquino: Thank you, Mr. President. You are saying it yourself that any accusation must be backed up with the proper data, with the proper numbers and currently Mr. President, right now, your assertions on the transparency server – is there any data? Or you are merely calling for opening up of the server for scrutiny, Mr. President. Marcos: No, quite the contrary Mr. President. We wouldn’t bother asking all of these authorizations to go in had we not spotted many discrepancies that need to be clarified. This is not a fishing expedition. It is something that is clearly in aide of clarifying the irregularities that were clearly seen and admitted to by both COMELEC and Smartmatic. Aquino: Mr. President, are you referring to the n problem or are you referring to the so-called trend that you were mentioning earlier? What irregularity in particular are you exactly talking about? Marcos: Again, there are many – too many I think for us to go through here. As I’ve said when I spoke that I will act at the proper time and the proper place. We’ll detail those irregularities, those discrepancies that we have found and furthermore to (inaudible) oneself, we’ll give reports, we’ll give analyses, we’ll give affidavits, statements from witnesses and many whistleblowers as well will come forward. And they’ve decided to come clean in their part on all of this. Aquino: So Mr. President, you’re saying that you have evidence and data but you don’t wish to say it today? Aquino: Well, Mr. President one thing that you mentioned earlier was the change in the trend. You talked I think about 8:00 PM when votes, when the trend started to go against you and for Congresswoman Robredo. And I’d just like to mention Mr. President for the record that numerous academicians have actually said that there is nothing irregular about that. Marcos: Numerous academicians have said that there is. So it is not …. Marcos: Ano ba ‘to, paramihan ng academicians? ‘O naghahanap tayo ng katotohanan? Aquino: Mr. President, if I may finish my question. And in that course Mr. President, a number of academicians have said that the likelihood for the simplest answer is true. That in the first few hours, the votes came from NCR, Region 1, Region 2. And of course Mr. President, you won handily in many of these areas. And, at around the date – the time – that you had mentioned, these are when votes that came from other areas from the Philippines where Congresswoman Robredo won started to come in. Mr. President, a lot of – you know, if you look at where these votes came from, the explanation is not as fantastic as maybe a hashcode change or a hacking that had happened but there are records, Mr. President, and I join you in asking COMELEC to open up these records to show exactly where these votes had come from. Marcos: At the proper time Mr. President, I will show that that trend did not depend on the early returns of votes that came from Regions 1,2,3 or wherever I am perceived to have been strong. The transmittal of votes – you have to separate the two – the official COC from the provincial canvasser and the transmitted votes from the precincts. As you know, the precinct votes were transmitted immediately upon closure of the precinct. And the COCs were only transmitted upon completion of the provincial canvass. So if we were to look at the actual precincts that had reported, that had transmitted results, then that contention that it is only from Regions 1, 2 and 3 that came in first is simply not true. Perhaps the first that came in were from those areas but in small percentages so that if you look at the percentages of votes that had actually come in from different places it was fairly even. Marcos: Unfortunate? Mr. President? I think I would characterise it rather as more than unfortunate. It is illegal. Marcos: Castigating Smartmatic does not remedy the situation. How was it allowed to happen? How was it allowed that the password of the COMELEC was used by a Smartmatic staff operative employee was allowed to use the COMELEC password to make that change without an end banker solution authorizing such a change? That is a question that up to this day we have yet to find an answer for. Aquino: And we join you Mr. President in trying to find the answers to these queries. Mr. President what I would like to ask is that if you are avering that these changes affected the elections, are you also saying that it only affected the vice-presidential race? Marcos: I do not know what happened. Exactly. This is the whole point. We do not know what happened when Marlon Garcia opened the file and changed the so-called ñ. What else did he change – did he change more? Did he change nothing? Did he change my name? Did he change the numbers? What did he do? What else did he do? And after he had done whatever it is he had to do, what else did anyone since the file was then opened, what else did anyone go in and change afterwards? And after the file was locked open, and that was by putting the first hashcode after the second hashcode, thereby, essentially locking it open. Who else went into that file and made alterations? We don’t know. That is the whole point of my – of what we’re trying to talk about. What happened? What is it – if we can be shown that the changes were indeed cosmetic, you will never hear about this from me again. But we still have to determine whether or not anything else was changed. What changes were made, who made them and under whose authority? Aquino: And more importantly, Mr. President, who should be penalized for that? I think you will agree with me on that, if I’m not mistaken. Marcos: I’m sure that this is part of the question but I think more to the point is we need to find out exactly what happened. We have to be sure that the conduct of the elections were in fact fair and honest and transparent. That is to this point, not that case, simply because we have not received any answers from the COMELEC on the questions that we have raised to them and we also have not received any authorisation to inspect the servers and the logs as we have asked the COMELEC. Aquino: Mr. President, just a final question. Mr. President, kung kayo na po mismo nagsabi na hindi ho natin alam kung mayroon ngang nangyari, hindi ho ba premature na sabihin na may pandarayang nangyayari? Kayo na po mismo nagsabi hindi natin alam kung may nangyari. Marcos: Wala pa akong sinasabi na may pandarayang nangyari sa pagpalit ng server. Ang sinasabi kong pandaraya ay iyong mga picture, iyong mga video na nakita natin na sa ibang lugar hindi pinayagang bumoto. Mayroon akong mga video na siguro nakita naman ng lahat ng tao – mga bago mag-rally, na nagbibigay ng pera at ng vote-buying etcetera etcetera. Lahat iyan ay pandaraya lahat iyan. Maliwanag dahil mayroon nga kaming ebidensya na mayroon ngang pandaraya. Ngayon, kung ang pandarayang yan ay doon lamang sa vote-buying, doon lamang sa intimidation, doon lamang sa hindi pinayagang bumoto ang ibang botante – kung hindi doon pati sa transparency server, doon pa rin sa server log, sa audit log ay ibang usapan yan. Dahil wholesale na iyan. Kaya iyan ang aming gustong makita. Kaya’t yan ang aming hinahanap at hinihingi – humihingi kami ng authorization galing sa COMELEC na tingnan para malaman. Eh, siguro naman ako na mauuna na matutuwa kapag malaman ko na hindi nagkaproblema. Ako na ang unang-unang magsasabi – mas gumaan ang aking loob dahil alam ko na ang nangyari. Eh, ang problema hindi tayo naipapaliwanag nang mabuti ng COMELEC at hindi tayo pinababayaan na tingnan ng mabuti para iliwanag nang mabuti kung ano ba talaga ang nangyari sa loob ng mga server, sa loob ng ating mga transmission, sa loob ng ating mga vote counting machine. Aquino: Mr. President, kung ikaw na po ang unang gagaan ang loob, ako na po yung pangalawang gagaan ang loob kapag naibukas na po ang lahat ng iyan. And I would like to thank the gentleman for answering my questions. I know it’s a very trying time for him and his family. Thank you for answering my questions, Mr. President. Thank you very much for that, Mr. President. Mr. President, thank you very much for your time. Bam: Huwag mong sabihing may dayaan kung wala kang ebidensiya! Sen. Bam Aquino made his pronouncement during his interpellation of Sen. Ferdinand Marcos Jr. during Monday’s Senate session. “Kung kayo na po mismo ang nagsabi na hindi po natin alam kung ano ang nangyari, hindi po ba premature na sabihin na may pandarayang nangyari,” Sen. Bam questioned Marcos during interpellation. “Wala pa akong sinasabi na may nangyaring pandaraya sa server,” replied Marcos, who earlier claimed that his lead was depleted after Smartmatic applied the cosmetic change on the transparency server. Aquino also challenged Marcos to back up his accusation with the proper data and the proper numbers to justify his call for the opening up of the server for scrutiny. 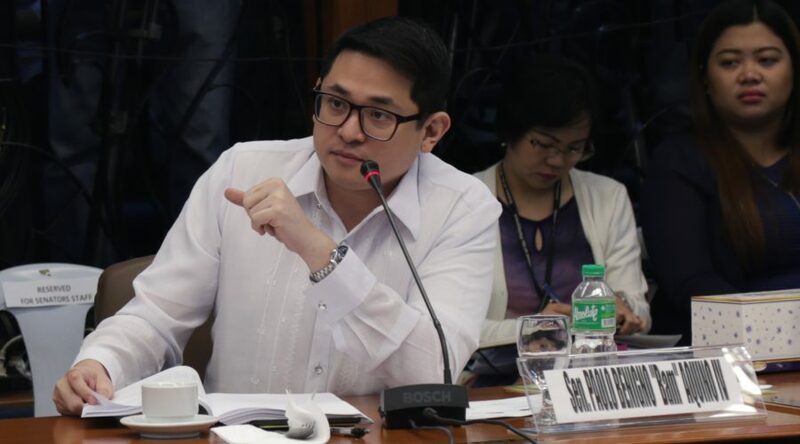 Sen. Bam Aquino thanked Bangladesh for its patience and assured that the Philippine government will leave no stone unturned to ensure the $81 million stolen from its central bank is returned as soon as possible. “Thank you very much, Mr. Ambassador, for being so patient in our hearings,” Sen. Bam told Bangladeshi ambassador John Gomes during the Senate blue ribbon committee’s last hearing on the hacking incident. Despite the adjournment of the hearing, Aquino said the process of returning the stolen money to Bangladesh will continue. “We won’t stop until the money stolen from the Bangladeshi people is returned, up to the last centavo,” said Sen. Bam. During the hearing, the Anti-Money Laundering Council (AMLC) confirmed that the $81 million was stolen by unidentified hackers from the Central Bank of Bangladesh. Of the $81 million, the AMLC said $15 million was returned by junket operator Kim Wong, $21 million allegedly went to casinos, $28 million is subject to Supreme Court’s decision on the petition for review and $17 million still at large. The AMLC said a court order is needed to forfeit the $15 million in its safekeeping while the Bangladesh government can file a third-party claim to prove that the money belongs to them. The process, according to the AMLC, will take about three to five months. 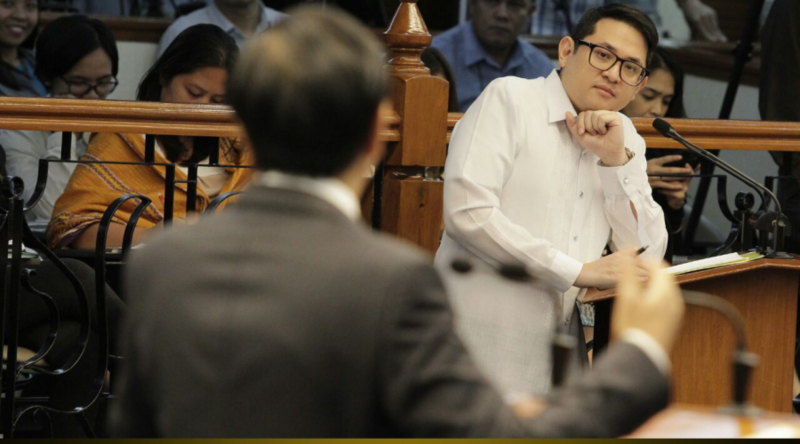 The measure that will provide utmost protection to Filipino children during disasters, calamities and armed conflicts is now a law, according to Sen. Bam Aquino. 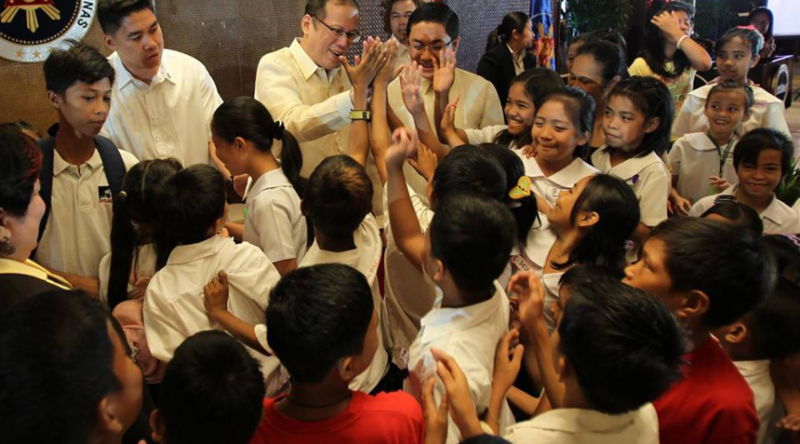 In a simple ceremony in Malacanang Tuesday, President Aquino signed Republic Act 10821, or the “Children’s Emergency Relief and Protection Act. “We welcome the enactment of this measure into law. This is timely especially with the La Nina phenomenon expected to hit the country in the coming months,” said Sen. Bam, chairman of the Committee on Youth and a co-author of the measure in the Senate. The law provides utmost priority to children during and after every disaster as they are the most vulnerable and are worst affected during disasters such as earthquakes, volcanic eruptions and flash floods. It will also establish child-centered training to disaster first responders, teachers, psychologists and other volunteers in disaster recovery, relief and rehabilitation, with special modules for different stages of children and youth development. It mandates the Department of Social Welfare and Development (DSWD) to formulate a Comprehensive Emergency Program for Children and local government units to integrate the said program in their development and Local Disaster Risk Reduction and Management (LDRRM) plans and budget. “While we have already made big improvements in the field of disaster risk reduction on a national and local level, now we have the opportunity to target our Filipino children, one of the most vulnerable sectors during times of calamity,” said Sen. Bam. According to Sen. Bam, existing policies will also be reviewed to give better support to Filipino children, especially during disasters, calamities or in armed conflict to help lessen trauma, restore normalcy quickly and build their resilience better. “We will continue to work in protecting our Filipino children during disasters, calamities, or armed conflict, but also to reduce trauma and build their resistance to these threats,” he added. During the onslaught of Typhoon Yolanda, Aquino said an estimated six million children were affected, according to data from Save the Children. “A national program is crucial in the most vulnerable areas of the country, where the experience of prolonged displacement would have a profound impact on the children’s sense of security, physical and emotional well-being,” Sen. Bam said. This is Aquino’s 13th law in less than three years as senator. Mga Bida, sa Lunes, dadagsa ang mahigit limampung milyong Pilipino sa mga presinto upang pumili ng mga susunod na pinuno ng bansa. Mahalaga ang pagpapasyang ito dahil dito malalaman kung ano bang landas ang tatahakin ng bansa sa susunod na anim na taon. Tayo ba’y babalik sa dating nakagawian o magpapatuloy ang mga nasimulang pagbabago at malinis na pamamahala? Ilang buwan bago ang halalan, nabigyan ang taumbayan ng sapat na kaalaman tungkol sa ating mga kandidato sa presidente at pagka-bise presidente. Tig-tatlong debate ang ginawa para sa mga kandidato sa pagka-pangulo at pagka- pangalawang pangulo. Sa tulong ng mga debateng ito, umaasa tayo na magkakaroon ng kaalaman ang ating mga botante na siyang magagamit nila sa pagpili ng tamang mga lider bukod sa mga patalastas at balita. Nitong mga huling araw, kabi-kabila ang mga batuhan ng putik ng ating mga kandidato, mula sa isyu ng kakayahan, kalusugan hanggang sa tagong yaman. Tinalo pa ng mga kontrobersiyang ito ang mga telenovela na napapanood natin sa TV. Mas madrama pa ang totoong buhay kaysa sa mga eksenang natutunghayan natin sa telebisyon. Ito’y natural nang kalakaran tuwing halalan. Para makakuha ng bentahe, babatuhin ng isang kandidato ang kalaban ng kung anu-anong isyu sa diyaryo, telebisyon, radio at maging sa Internet. Kaya nga paborito kong naririnig mula kay Liberal Party (LP) vice presidential candidate Leni Robredo ang linya na “sa huli, karakter pa rin ng kandidato ang titingnan ng tao at katotohanan pa rin ang mananaig”. Kaya nga sa ating pagboto, huwag tayong basta maniwala lang sa balitang nababasa natin sa mga diyaryo, naririnig sa radyo at napapanood sa telebisyon. Maiging tingnan natin ang karakter ng isang kandidato. Tataya ba tayo sa isang kandidato na may record ng katiwalian o di kaya’y pagnanakaw o sa walang bahid ang record sa pagseserbisyo sa publiko? Pipiliin ba natin ang kandidatong maluho sa buhay o simple ang pamumuhay? Papanig ba tayo sa kandidato na gumagamit ng lakas at dahas sa pamamahala o doon tayo sa binibigyang boses ang lahat, hanggang sa nasa laylayan ng lipunan? Pabor ba tayo sa kandidato na gumagamit ng perang nagmula sa nakaw sa kampanya o doon tayo sa nakasandal sa lakas ng sambayanan para magwagi? Doon ba tayo sa kandidato na puro dada lang o iboboto natin ang taong subok na sa paglilingkod, kahit noong wala pa sa pamahalaan? Mga Bida, ako’y napagpasya na ng aking pipiliin sa balota. Isa lang ang nasa isip ko sa pagpili ng bise presidente, ang numero singko at ito’y si Robredo.